is needed as well as the Memorare for this intention. Legionary priest, Father Thomas Berg. Consider reading it. asked to do by the Church, I predict it will be some tough medicine and I ask that all of us stand on the side of the angels. This is an opportunity for excessive criticism and unflattering talk. It is time for prayer and conversion of life. Communications Day the Vatican has rolled out some new tech initiatives. The Pontifical Council for Social Communications has been working overtime these days to bring the Church into the 21st century via technology. According to the recently published Annuario Pontificio, the papal yearbook we see the number of Catholics in the world has increased by 1.4%, with particularly in Oceania and Africa. Vocations to the priesthood grew overall by 0.4%, though they decreased in Europe. 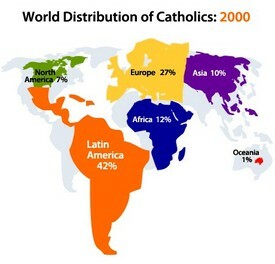 The Press Office of the Holy See stated that the worldwide Catholic Church included 1.147 billion people in 2007, a 16 million increase since 2006, and compared with the map to the right, the current numbers are significant. The numbers of baptized grew significantly in Oceania and Africa by 4.7% and 3%, respectively. Also positive was the growth made in Asia (+1.7%) and Europe (+0.8%). While North and South American Catholics decreased by 0.1%, they still represent half of all Catholics on the planet. One notices moderate growth in the number of priests which according to those in the know, this trend began in 2000 after more than 20 years of steady losses. The year ending in 2007 saw the presbyterate rise from 405,000 to 408,000. Africa and Asia reported strong numbers, whereas numbers were stable in North and South America. Of course, the continents of Europe and Oceania reported significant declines during the same period. Looking more globally at the situation of vocations to the priesthood, the numbers increased by 0.4%, approaching 116,000. Africa and Asia grew in priestly vocations, while Europe and America registered respective reductions of 2.1% and 1%. The statistical information is based on gather stats from 2007. The BBC has an article on the increase of Catholic priests, read about it here. Today marks 80th anniversary of the establishment of Vatican City State by the signing of the Lateran Pacts of 1929 by Benito Mussolini and Pietro Cardinal Gasparri. 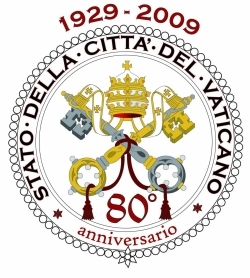 This Pact establishes Vatican City as an independent state, restoring the civil sovereignty of the Pope, compensated the Holy See for loss of the papal states and outline the relationship between the Roman Catholic Church’s and Italy. On 25 March 1985, the Italian Parliament ratified a signed agreement (18 February 1984) which modifies the Lateran Pact. The temporal government of the Church is technically under the pope as head of state but he appoints a president for the temporal affairs of state. 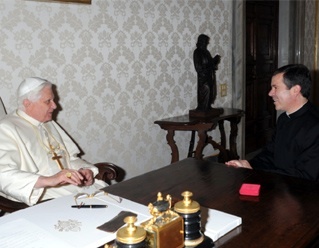 Currently, the President of Vatican City State is Giovanni Cardinal Lajolo; the cardinal has legislative and executive authority regarding the temporalities (i.e., persons, policies & properties).